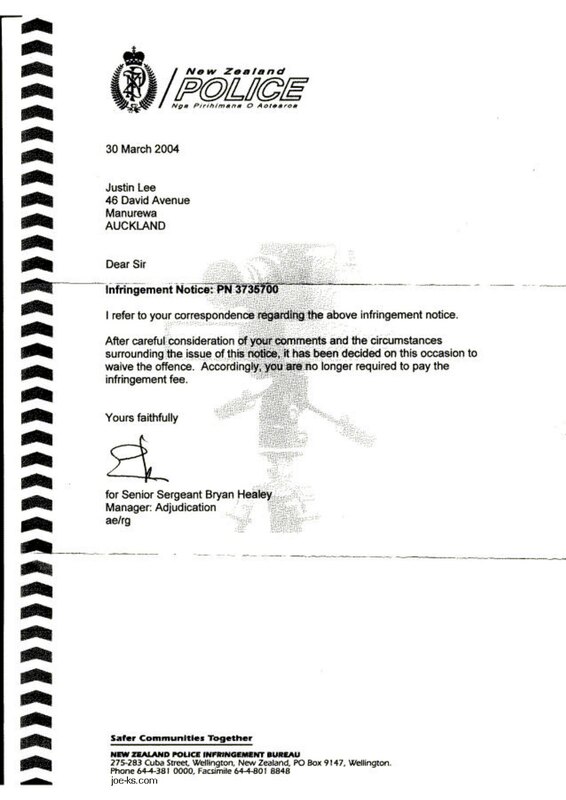 Yesterday, I was presented with the above infringement notice (copy attached for your records) while returning home from the Parachute music festival at Mystery Creek near Hamilton over the long Auckland Anniversary weekend. I had a most excellent weekend, but that is not why I’m writing to you at this time. Unfortunately, there are a couple of irregularities with the infringement notice that are causing me some consternation and hopefully you can clear them up or, preferably, forget about the whole thing entirely. Firstly, the ‘date of offence’ is listed as the 23rd of June 1974 with the time being at or around half past six in the evening. This is of grave concern because I was not issued a drivers license until sometime in 1990 and I have no desire to be charged with driving while not legally licensed. I do not have a clear recollection of very much at all before I was three and a half years old, so I rang Mum to see if she remembered what I was doing that day. She said that – coincidentally – I was born on that day! Mum mentioned that I was born at around five o’clock in the evening on that day in Porirua, which is not far from Wellington. She also said Porirua was a bustling suburb of young, low-income earning people who were trying to get ahead. Back in the 70’s, people were coming to terms with oil shocks, high-inflation and wage freezes, but that’s not important right now. For me to have traveled from Porirua to the foot of the Bombay Hills just out of Auckland by six thirty, I would had to have crawled into the first car in the hospital parking lot and headed for Auckland at around 1,000 km/h. For this reason, it is entirely possible that the constable who clocked me back in 1974 was holding his laser equipment upside down and instead of doing 116 km/h as per the infringement notice, it is more likely that I was doing 911 km/h. This is where it starts getting really strange. The car that I must have crawled into had the same license plate as the one I have now – AEH924 (according to the infringement notice). However, my car is a dark gray Nissan Bluebird SSS, with dual cup holders, 1800 cc’s of grunt, air-conditioning and electric windows. You will notice that a time-travel option is not included on this model, so that rules out any “Back to the Future” issues and the car I was driving back then could not have been the one I drive today. This is clarified by the infringement notice which states that the vehicle was a Honda saloon. How this relates to my Nissan Bluebird, I cannot fathom. I can only hypothesize that, back in 1974, the first range of proto-type Hondas had an automated number plate changing mechanism (like on the A-Team) which were used to avoid parking tickets and facilitate safer getaways from burglaries, armed hold-ups and the like. So to recap, it appears that on my birthday on June the 23rd 1974, I crawled out of the maternity ward, hijacked a seriously high powered Honda saloon with an automated number plate changing mechanism, drove to Auckland at close to Mach 1, was pulled over approaching the Bombay Hills and unwittingly changed the automated number plate changing mechanism to show the same number as a car I would come to own almost thirty years later! (The chance of selecting the same number plate is a mere 1 in 308,915,776 – so quite conceivable). - Evading the law using an automated number plate changing mechanism. If you could provide a clearer indication as to why the ‘date of offence’ is the same as my birthday, and why the vehicle make and type bears no resemblance to the number plate listed on the infringement notice, it would be appreciated. Mind you, I wouldn’t be too disappointed if we agreed to let this one go. I could really use the $120 dollars as I’m lowering my Nissan, installing an excessively noisy waste-gate and boring it out for better performance in the street drags down Te Irirangi Drive and around Weymouth. Thank you for considering my submission. I look forward to hearing from you.